1stGen.org • View topic - Finally to truck out but it has not Power!!!!! Finally to truck out but it has not Power!!!!! Ok so after I fixed every other problem with my truck I took it out for a drive and now the truck has no power, frustration is setting in. I have already turned the pump up so I know that’s not it. The motor Will Rev up but there is no power behind the rpms. It feels like it just stops fueling at about 1/4 throttle. Is it possible the fuel pin could be stuck or something? The motor sat for a while but the pump is a fresh rebuild and was done professional and put on a flow bench so I’m at a loss..
Re: Finally to truck out but it has not Power!!!!! How is the fuel supply? Got a pressure gauge on it somewhere after the lift pump? Sounds like it's not getting enough fuel. could try a new fuel filter also, simple things first! I'd try lubing the horizontal pin that rides on the fuel pin as well, if it's stuck in a dry o-ring it could cause the exact issues you're having. Put a little grease on the fuel pin as well so you can see if the horizontal pin leaves a track. It's good preventative maintenance to lube the o-ring where the afc line connects to the cylinder head as well, while you're pulling the pump top off.Tightening and loosening a dry 25 yr old o-ring repeatedly can cause them to crack. Which can potentially cause further issues. Make sure you have the correct banjo bolt on the return outlet of the pump. The proper one has a tiny orifice to restrict flow. 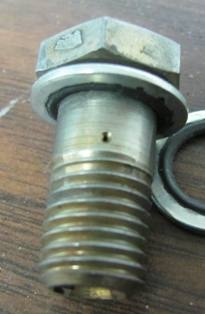 Do you have a pic of the correct banjo bolt? - I verified that I have the correct banjo bolt on the return line. I still have to check the fuel Pin. Does anyone have any more ideas or things I can check.